As well as being widely used in foods and drinks, additives and E numbers are also commonly used in cigarettes. 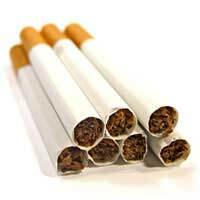 What’s more, they’re used to the advantage of the manufacturers, to help smokers get hooked to cigarettes and buy more. It’s easy to overlook the fact that additives exist in more products than just foods and drinks. A very wide range of additives have long been used by the manufacturers of cigarettes to help the products taste better and increase the addictiveness of the cigarettes. Different brands of cigarettes have different additives and flavours contained within them, which is often why smokers love one particular brand more than others, and it’s a crafty move. The staggering fact is that there are over 600 additives permitted for use in tobacco in the UK – that’s an awful lot of different additives! Nicotine on its own is already very addictive and the issue of adding even more chemicals into cigarettes to make smokers become hooked has been the subject for much criticism over the last 10 years. Anti-smoking campaigners have shared their horror over the use of additives in cigarettes, especially as it means it makes quitting smoking even harder for smokers to achieve, since there are additional ingredients for them to battle against. In the past, cigarette manufacturers were allowed to get away with adding umpteen unknown additives to their products without the need to disclose what they were using to consumers. However, increased concern over the huge number of additives being included in with nicotine has thankfully made it a requirement that details of the additives should be declared and made public. Acetone – an additive, but also an ingredient that’s commonly used to make paint stripper. Ammonia – the toxic smelling chemical that’s found in cleaning products, such as toilet cleaner. Beta-naphthyl methylether – the smell found in mothballs. Butane – which is otherwise used as a form of lighter fuel. Hydrogen cyanide – the poisonous gas that’s used in gas chambers. Methanol – which is a form of rocket fuel. Carbon Monoxide – the poisonous gas that comes out of car exhausts. Knowing of all the extra additives included in cigarettes may serve to make them even less appealing – which isn’t a bad thing, since cigarettes are so bad for your health anyway. It is also worth bearing in mind that the effects of inhaling smoke – and all these awful additives – is not just restricted to the smoker, but also to anyone in their vicinity, who may be passively affected by the smoke in the air around them. If you don’t want to be affected by these additives, or nicotine, or don’t want your family to have to breathe them in either, then the best way of avoiding it is to not smoke.